Bananas are surely the best known tropical fruit and one of the most healthy and versatile. Bananas originated in South-East Asia and have grown in the Tropics since ancient times and beyond. There is a theory that the fruit of the Tree of Knowledge in the Garden of Eden was actually a banana. 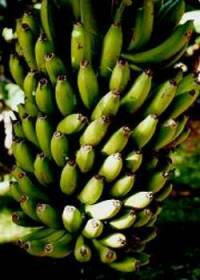 Banana was the first fruit cultivated by man. Wonderful luscious tropical leaves great as a backdrop or centre piece to your garden. Against a house, around a pool or in a courtyard. A good source of ascorbic acid (Vitamin C), Vitamin A, Vitamin B6, Potassium, with some calcium and iron. They are low-salt, low-fat and are cholesterol-free. They can be eaten fresh and used in salads, desserts, breads, cake and drinks; the list is endless. 1 bunch of bananas per stalk/plant. Full sun & sheltered. Fruiting is governed by sunlight and warmth on the trunk. To encourage the warmth, stack compost around the trunk well up the stem but not touching, as this mulch could create a lot of heat & burn the plant. Wind is a common constraint as high winds may cause banana cultivars to topple. In addition, continuously windy weather may cause severe left shredding, drying leaves, and plant crown distortion. Grown in the shelter of buildings is ideal. Can be grown in sheltered sites by the coast but are not tolerant of saline conditions. Susceptible to frosts and will flourish under uniformly warm & hot conditions. Not too severe frosts will burn the leaves and the banana will grow back. Need regular moisture especially during hot periods where the large leaves will transpire heavily. Soil moisture is one of the most important factors; lack of water at any time may cause a reduction in fruit numbers and size. Even though soil moisture is important, soil drainage is just as important, sloping land will help with this. Ideal slightly acid soil. Apply high potassium fertiliser every 6 weeks during the growing months. The amount of fertiliser depends on size and age of stalk and the number of stalks per clump. Or simply add regular compost and manure to feed and protect the shallow roots. Remove all but 2-3 sucker growth. Select the main plant with a broad base and very fast taper to a point - (almost pyramid shaped). The more slender suckers may not flower or will produce a much weaker flower. Removed suckers can be replanted elsewhere. No major insect or fungal problems in most warm temperate regions, though wildlife may seek out the ripening fruits. Cold wet weather can set the plants back and encourage root rot. Virtually all growth stops at 15°C but plants can survive -2°C for short periods, but temperatures below -4°C may kill the underground rhizomes. Plant them in a warm sheltered position with good drainage. The information contained in this website is a general guide only. Whilst every effort is made to print accurate information, no responsibility is accepted by Tharfield Ventures Ltd or any employee or any associate for opinions expressed or information printed. We encourage anyone considering planting commercially to get advice from local consultants with experience in their specific area as they will be able to assist with crop suitability and cultivar choice.